Hot diggity. LG just announced an insane 5.5-inch smartphone screen that has pixels that must be made from some sort of mixture between dense diamond sparkles and unicorn blood paint. 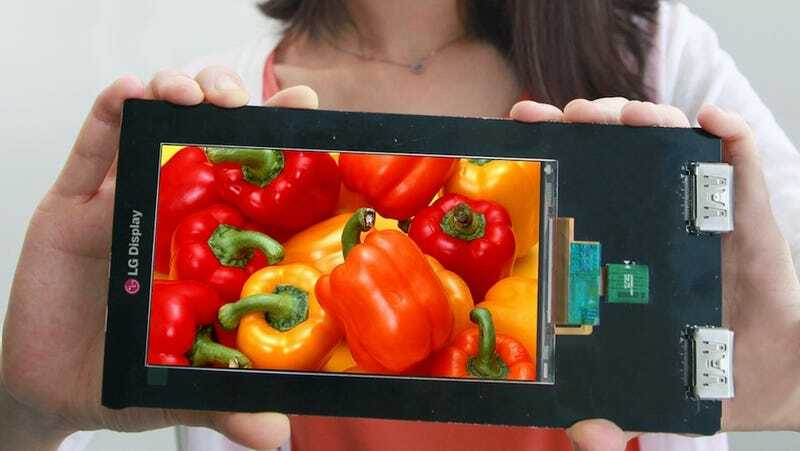 More seriously, the 5.5-inch AH-IPS LCD display's resolution is 2,560 x 1,440 (Quad HD) and packs 538 pixels per inch. That makes it the highest resolution and ppi for a smartphone panel. For comparison, the Samsung Galaxy S4 has 441 ppi while the HTC One has 468ppi. So yeah, it's got current displays beat. Even crazier, the display is only 1.21mm thin with a 1.2mm bezel, which is shockingly thinner and narrower than the 5.2-inch 1080p panel that LG introduced last month (and promptly called the slimmest). So yeah. Hot. Diggity.